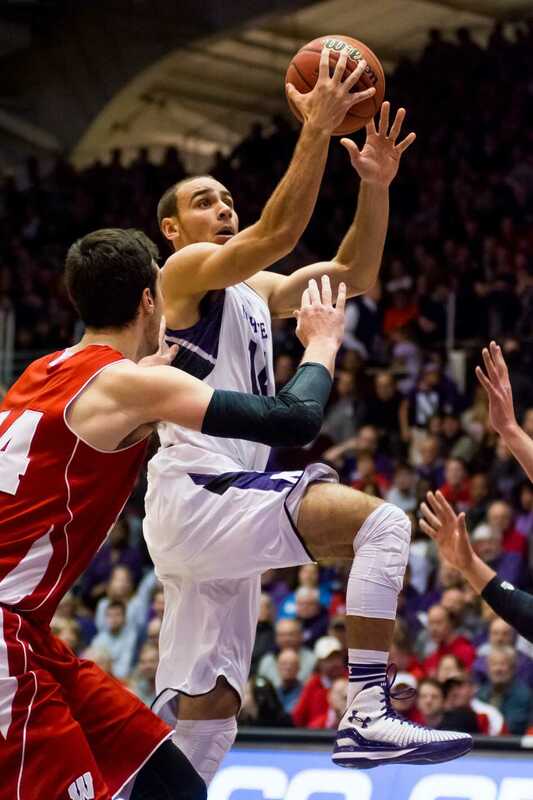 Tre Demps drives toward the basket. The junior guard strengthening his crunch-time scoring reputation with 12 of his 17 points in the final seven minutes of regulation. Unfortunately, Demps missed a potential game-winning shot in the final seconds of the second half. After Northwestern was held scoreless in the opening four minutes of Sunday’s contest against Michigan State, the game appeared to be all but over. Although the Wildcats (10-6, 1-2 Big Ten) ultimately fell 84-77 in overtime to the Spartans (12-5, 3-1), the contest was far from being a blowout. The teams were tied at halftime and again at the end of regulation, with each team claiming several leads throughout. NU had a good shot at winning until it faltered in the final five minutes. JerShon Cobb was the player who got the Cats going. After NU’s starters went down 9-0 at the first official timeout, the senior guard came off the bench to score 10 of the Cats’ next 12 points. Cobb finished the game a perfect 5-of-5 shooting with 12 points, four assists and two rebounds but was limited in the second half due to his ongoing health problems. After Cobb ignited the offense, freshman guard Bryant McIntosh and junior guard Tre Demps kept the points coming. McIntosh in particular impressed, running the offense and tying for a game-high 18 points to go along with five rebounds and five assists. But despite McIntosh’s continued strong play, Collins turned to the more experienced Demps for NU’s most important possessions. Revered among Cats fans for his late-game heroics, Demps had the ball in his hands for the final shot of regulation with the game tied at 72. As time expired he dribbled left off a screen and elevated for a minimally-contested long two, but the shot fell just short to send the game to overtime. Despite the disappointing loss, Collins lauded his team’s performance. The coach said his players “bring it every night” and felt that ferocity was evident Sunday. NU’s downfall was its sputtering overtime offense. In regulation, the Cats shot an astounding 54 percent from the field, along with an equally absurd 55 percent rate from 3-point range. In the extra period, though, NU shot just 11 percent from the field and 20 percent from behind the arc, scoring just 5 points in overtime to the Spartans’ 12. But normally stout NU also struggled defensively throughout the game. Michigan State shot 50 percent from the floor and all five of the Spartans’ starters finished with double-digit point totals.Michigan guard Travis Trice led the way, recording a double-double with 18 points and 10 assists. He also got to the free throw line 10 times, making eight of those attempts. And despite NU being the bigger team (Michigan State doesn’t have a player on its roster listed taller than 6-9), the Cats struggled on the boards. NU was only out-rebounded by one but didn’t have an offensive rebound until 4:05 remaining in the second half. The difference in second chance points proved critical for the Spartans. Collins was dissatisfied with the loss but still saw plenty of positives with his team’s tough performance in a difficult game. The Cats continue conference play Wednesday when they return to Welsh-Ryan Arena to take on Illinois.